School is out for the summer, the pools are open, and in some cases the kitchens are closed! Many families move their cooking to the great outdoors with the summer season. Cooking out or grilling helps keep a home cooler while avoiding the use of an oven or stove indoors. One of a kind concoctions are put together as grillmasters attempt to master the grill. At Hutcheson Horticultural Company, we specialize not only in landscaping design and installation, but also in the custom design and installation of hardscapes. While our custom installs have included pool surrounds, paver or stone patios, fireplaces, firepits, and walkways, we thought it was time to turn our attention to grill islands. 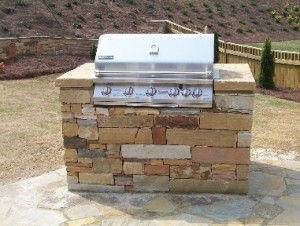 With an increasing trend of extending living space to the outdoors, many custom installs include outdoor grill islands and stove tops. There are quite a few inspirational examples that can be found on HGTV. These examples will allow your imagination to run wild. What does your dream outdoor living space look like? Share your vision with us, and we can help turn your vision into reality beginning with a consultation. Make sure you follow us on Google +, Facebook, and Twitter for other seasonal tips to make your landscape and hardscape in Woodstock and the surrounding areas simply amazing.